Braintree striker Dan Holman believes joining the club is an important step towards fulfilling his ambition of playing in the Football League. 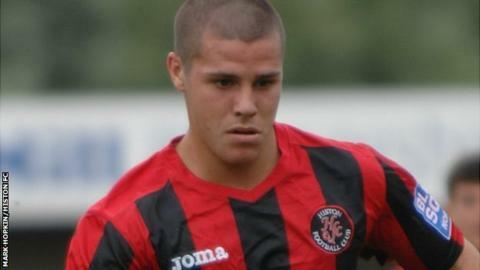 The 22-year-old has scored three times in two games since moving to the Blue Square Bet Premier club from Histon. "Every young player wants to play as high as they can," he told BBC Essex. "I've just made the step up from the Blue Square Bet North to see if I can do it at this level. So far, so good and we'll see where it takes me." Holman's 29 goals for Histon persuaded Braintree boss Alan Devonshire to take a gamble on him proving equally effective at the top level of non-league football. And after marking his debut with a double at Woking, he scored the winner from the spot as they beat Tamworth 2-1 at home. "The way Braintree play definitely suits me - playing up front with Gashy [Michael Gash], he's winning the headers and I'm working off him," added Holman. "Obviously scoring goals helps you settle in. It gives me confidence and gives the lads confidence in me, it helps all round really." Braintree are one of the smaller clubs in the Premier division but finished 12th last season and Holman believes they have the squad to make an impression this term as well. "I don't see any reason why we can't do well in this league. I've played two games and we look really strong in my opinion," he said. "Obviously I wasn't here (so) I didn't see anything last season, but from what I've seen this season, I think we can do really well."